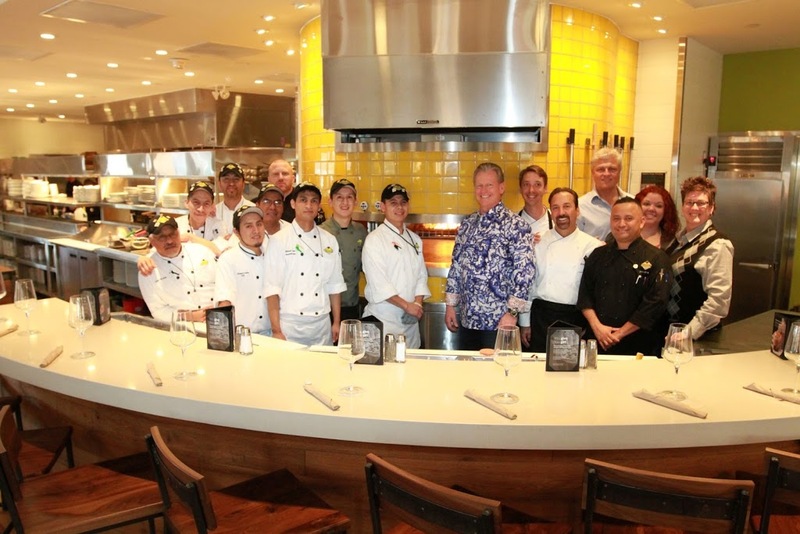 With its new ‘reimagined’ concept demonstrated at its new flagship restaurant in Sawgrass Mills, California Pizza Kitchen plans to bring a stronger California infusion to locations throughout the country and continue to serve up a fresh, hip, energetic, interactive atmosphere for its guests. At the new restaurant, guests will notice a totally re-created communal space with flexible, less structured indoor seating, including a family-style table seating 16, versus traditional fixed built-in booths. Other new seating options include a large social-styled bar near the entrance or an outdoor terrace fitted with comfortable lounge seating areas and fire pits. 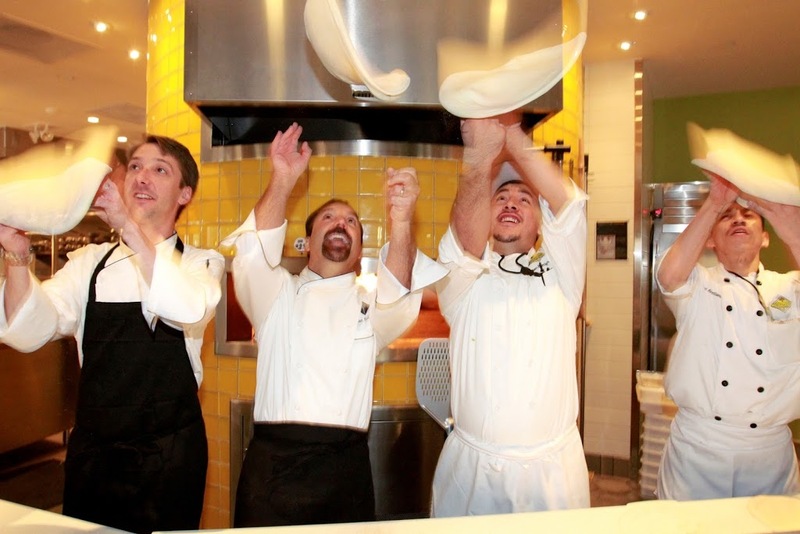 California Pizza Kitchen’s traditional pizza counter has been re-designed to make the hearth an even bigger focal point, giving guests the opportunity to interact with CPK’s pizza chefs and watch them at work as they now hand-stretch and toss CPK’s signature pizza dough. California’s notable environmental roots are evident in CPK’s use of unfinished reclaimed wood in and outside of the restaurant. Trestlewood planks salvaged from the Great Salt Lake railroad trestle don the entrance and patio walls. Reclaimed solid Timber Oak Planks reused from old barn timbers throughout America, and painstakingly refurbished to retain knot holes, hand-tooling marks, nail holes, and other character marks flank the bar and Herringbone walls. Tables are made of salvaged solid American White Oak rough sawn wood with natural knot holes, variations and other character marks. To further transport California into the South Florida locale, a gallery of canvases fills a large wall with black and white photos of California interspersed with full-color photographs of favorite local spots. CPK’s authentic California approach to cooking and dining means creating interesting, freshly-made items prepared with high quality ingredients and uncomplicated pairings (flavors, dishes, beverages). Its new menu and beverage offerings have been designed to encourage guests to go on culinary adventures including three wine flight options: Keep Calm and Chardonnay, California Reds and Adventurous, each allowing guests to experience three, 3-ounce glasses of different wines from the menu. Eight signature cocktails are also being introduced including “Route 1,” made with Hangar 1 Mandarin Blosson Vodka and 1800 Silver Tequila and a Strawberry Basil Martini made with VeeV Acai Spirt, Perfect Puree Strawberry and fresh agave sour. The new flagship, the seventh full-service CPK in South Florida, will open with its location at Sawgrass Mills Mall in The Oasis, across from Nordstrom Rack at 2610 Sawgrass Mills Circle, Sunrise, FL 33323. Operating hours (including curbside take-out with designated reserved parking) are Sunday: 10 a.m.-9 p.m.; Monday-Thursday: 11 a.m. -11 p.m.; Friday and Saturday: 11 a.m.-12 midnight. For more information, call (954) 465-2041; fax number for take orders is (954) 845-1192. 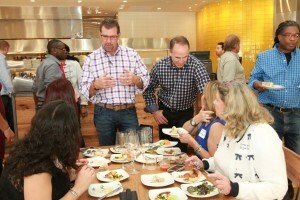 Born in Beverly Hills in 1985, California Pizza Kitchen (CPK) is a leader in authentic California style cuisine and is widely known for its innovative menu items. California Pizza Kitchen provides a range of creative dishes, from signature California-style hearth-baked pizzas, creative salads, pastas, soups and sandwiches. 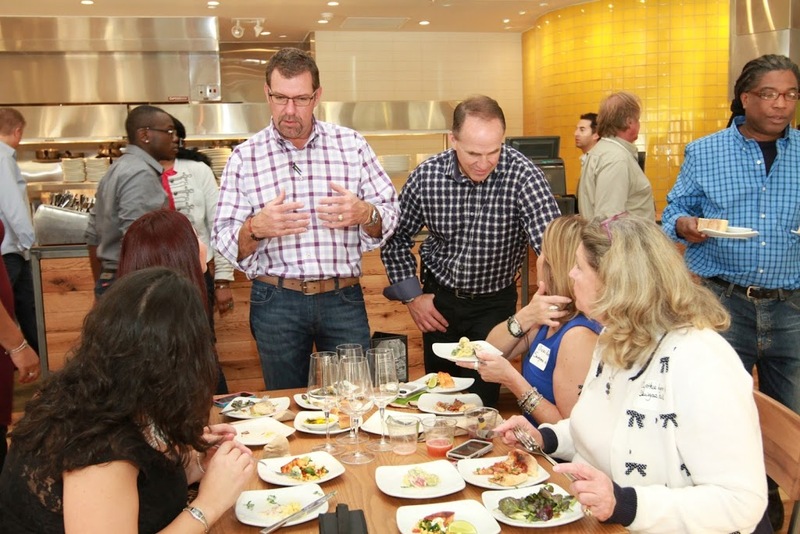 A SoCal classic, CPK incites international cravings in over 10 different countries. For more information on California Pizza Kitchen visit www.cpk.com. Follow them on Twitter @calpizzakitchen and like on Facebook at www.facebook.com/californiapizzakitchen. Bonnie Kaye, Kaye Communications, Inc.